Tales is out tomorrow! Saturday in the print edition of The Star. Target is a year and a half old now, but although he's technically a man-cat (and incidentally just as tall as Au) I still think of him as a kitten. Target behaves like a baby too. He has a waddly walk, a tiny baby meow, and begs to be picked up and cuddled constantly. When he's in bed, he leans up against me and paddles his paws in my hair. Au looks on at Target's baby ways with superior disgust. Au is a very grown up cat who doesn't tolerate mushy stuff. But when Target and I are having a fuzzy session, I can see that glint of relief in Au's eyes that says, "Glad that's not me!" Here is one of Target's baby pictures. This was him on his second day with us, being introduced to a new toy: a spray of wild grass. 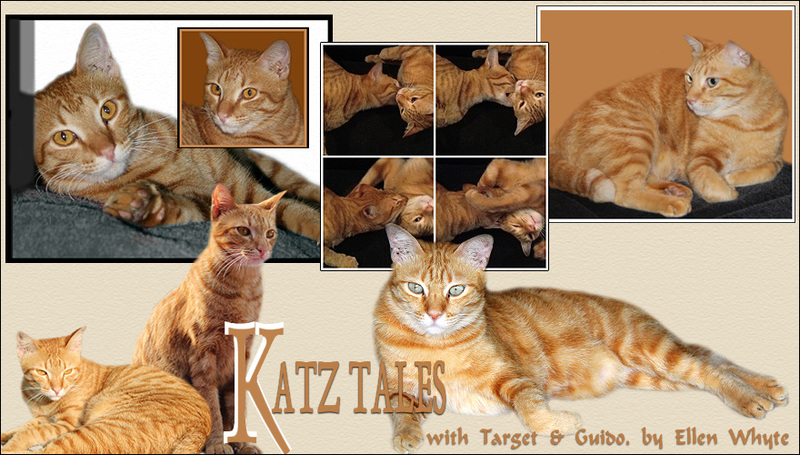 I'm not sure if Katz Tales is out in the Star Weekend section this week, The schedule is messed up and I won't be told if it's on or off for another day or so. However it falls out, I'll amend the top of this post with a note. Happy Cats on Tuesday. For more, visit Gattina. Target you were such a cutie! Target is such a darling! He could fit right into your purse back then, couldn't he? By the way, someone gave me a copy of this month's Her World and I saw the write-up! Thank you so much! Am so touched and honoured! I wished my Arthur was like that ! he is more like Au and it's a favour he gives me if I am allowed to pet him ! He never sits on my lap either, but likes to sleep with me in my bed from time to time. He is also the only one Rosie would tolerate, because she is very jalous with Pookie and Lisa. Hahahaha.... I know exactly what you mean. Sesame is 2.5 years old now and is the biggest Spice Cat, but he is still a baby to me. Target is a cute baby!!! I know what you mean. Olli has this baby voice too and I think it will stay. Oh, Target's such a doll! That is a very adorable cat! I have three of my own, at http://greatminds2u.blogspot.com under cats/pets. Yes, your article came out in The Star saturday, and that's what brings me here.